I wrote about my method for preparing for a double edge razor shave before. I believe that the most important part of a good, close, safe and comfortable shave is the preparation before you put your blade to your face. As time has passed and I’ve tried a few different blade and razor combinations, I still think it’s true. The hardware you use refines your experience, but the prep you do defines it. I had a pretty well-defined pre-shave routine that was working well for me. I would wash my face and neck in the shower with a mild liquid soap, I would’t dry my face while toweling off, and then apply warm water and Arko soap via a shaving brush. After massaging the soap into my face I applied a hot towel to my mug for about two minutes or so. Then I reapplied shaving soap and let the razor do its work. My friend BigDubb was telling me about how much he liked using pre-shave oil and that I should give it a try. 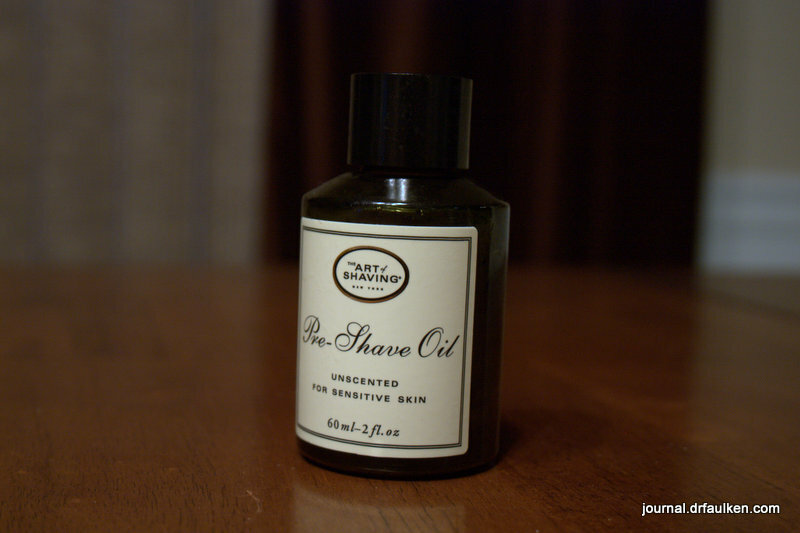 Pre-shave oil is one of the many points of contention within the artisan shaving community. Some swear by it, some hate it. Those who use and like it say that it helps their skin stay soft and nick-free during shaving. Detractors claim pre-shave oil hide poor products and inferior / inexperienced technique. There’s quite a divide over the issue, and if you are a member of shaving forum Badger & Blade you may have read one of the many debate threads about pre-shave oil. There’s more to discuss even if you like pre-shave oil. There’s the obvious scented vs unscented, and then the “which scent is best” debate. More importantly, there’s the debate on what’s better: a pre-shave oil that helps lubricates the skin, or a pre-shave oil that lubricates the shave. I’ll explain how pre-shave oil works in order to explain the debate. Okay, so one of the ways that shavers nick themselves is that skin is less flexible when it’s dry. A blade going over dry skin is more likely to catch, and more importantly the skin is less likely to conform to the slight pressure of the blade. Keeping the skin moist is critical to a close, comfortable shave, which is one of the reasons people suggest shaving right after the shower — your skin is pretty damp from all the water and the steam. Now, most pre-shave oils work by trapping moisture in the skin and helping the skin to stay soft via an emollient. This means that pre-shave oils that hydrate your skin the most effectively are absorbed into your skin, holding water and the natural moisture of your skin hostage. However, some folks like their pre-shave oils to make their shave “feel” more smooth, and this is done by coating the skin with a layer of lubricating oil. This is a subtle but important difference. These “lubricating” pre-shave oils work by not being absorbed into your skin. They give the shaver the impression of a smoother shave, but they are not really hydrating the skin and keeping it soft. It works by not being absorbed into the skin. I personally prefer the traditional pre-shave oil strategy of hydrating the skin and making it soft. One of the big knocks against the lubricating style of pre-shave oils is that it tends to be thicker and gums up the blade. If you’re a straight razor kind of guy you probably don’t have to worry about it, but for those of us who use safety razors, especially razors with a safety bar, we want to keep the blade surface consistently clear of as much stuff as possible. So that’s how pre-shave oils work, and the two different types of pre-shave oils that are in production. Commercial pre-shave oils sometimes try to do both, with manufacturers leaning towards different ends of the spectrum. Despite the label saying “Unscented,” there was definitely a scent to the Art of Shaving pre-oil. I guess it’s worth clarifying that it’s not “non-scented,” in retrospect BigDubb and I should have interpreted the label as “no additional scents added.” Just be aware, and you won’t be surprised. I put a nickle-sized amount in my palms, and massage the oil into my wet face. I do 10 seconds on the throat, then 10 on my face, then 10 more on the throat. After that I put a hot towel on my face for two minutes. I do not wipe the oil off, but splash my face with hot water several times before applying the Arko shaving soap. I thought the Art of Shaving pre-shave oil was going to be hokum, but I was very impressed after my first few shaves with it. My skin felt very soft after use, and my shaves were nice and close without any nicks or cuts. I even started shaving with an “open comb” style razor, which means that there’s no safety bar to manage the distance of the blade from your face. I attribute my blood-free shaves with the open comb razor to my preparations, and the pre-shave oil was a big part of it. I did notice that my razors were a little more gunked up than normal. I usually swish my razor in a mug full of hot water, and that does the trick. However, we traveled to Colorado for a week and I was unable to take a lot of my shaving kit with me. I used a small coffee mug for rinsing, and I could never get enough agitation in the mug to get all of the shave oil plus shaving soap off. Once I got back home everything was fine. If you rinse your razor in a sink filled with water or under a strong tap you’ll probably be okay. So what’s in it, and why does it cost so much? I liked the Art of Shaving’s pre-shave oil a lot. BigDubb let me have his old bottle, and there was about 1/5th of the oil left when I got my grubby hands on it. I was ready to buy more, but the pre-shave oil currently retails for $25 for a two ounce bottle. I started researching other pre-shave oils, and the Art of Shaving’s line is actually quite “affordable” compared to other manufacturers. Some companies are selling two ounce bottles for as much as $65! If you’ve read any of my other posts, you know I’m all about finding the best bang for my buck. I’m not opposed to paying a lot of money for stuff, but I want to know why what I’m buying is worth it. I looked at the ingredient list, did some research, and decided to make my own pre-shave oil. The unscented formula is mostly olive oil and castor oil, with a few undetermined essential oils thrown in. The Art of Shaving Web site lumps all of the ingredients of their pre-shave oils into one page, so it’s hard to tell what’s in one mix versus another. However, none of the ingredients are particularly expensive or hard to obtain. I’m not ready to let the cat out of the bag yet, but let’s just say that people shouldn’t have to pay $65, or even $25, to get a good quality pre-shave oil. Stay tuned. In the meantime, I do recommend the Art of Shaving’s unscented pre-shave oil. I was skeptical at first, but the effects are undeniable. I get a closer, nick- and weeper-free shave, and my skin feels super super nice afterwards. If you are in a hurry to try pre-shave oil or want to pick some up, I’d recommend the AoS product line over more expensive and just as effective alternatives. Freedom costs a buck-o-five (Frank Miller's 300 review, no spoilers inside).